The Mamas and Papas Apollo Bouncer is a solid and reliable baby bouncer. It doesn’t boast many of the high-end features of more expensive bouncers. But, the reasonable price justifies the fewer features. Great aspects of this bouncer are the sturdy and safe build as well as the awesome padded seat that ensures baby’s comfort. Even with the lack of bigger features, you are making a solid purchase with the Mamas and Papas Apollo Bouncer and it does a great job of keeping baby entertained and safe while you enjoy a few moments to yourself. The Mamas and Papas Apollo Bouncer is a reliable choice for those looking for a simple bouncer on a tighter budget. For the Mamas and Papas Apollo Bouncer, safety is neither top of the line nor an issue to be concerned about. The design is very sturdy with a wide base, floor grippers to prevent sliding, and a solid seat to hold your baby in place. A three-point padded harness is included with this bouncer, making sure your baby doesn’t go anywhere despite the fun they might be having. An included head pad provides addition support for newborns. However, the head padding does not fasten or attach into the bouncer which can cause it to slide around a little. This takes away from the purpose of the head support and might not provide the best support for newborns with already underdeveloped muscles. The Mamas and Papas website also states that this product shouldn’t be used for prolonged periods of sleeping. This is especially important if there are parts that aren’t attachable and can accidentally cover baby’s face. The Mamas and Papas Apollo Bouncer has a larger oval-sized seat for baby to rest in. The shape of the seat might be comfortable for newborns and younger babies who still have a C-curved spine, but it is not ergonomic or supportive for proper spinal development and support in the long run. The large, padded seat of the Mamas and Papas Apollo Bouncer looks cozy enough to crawl in and take a nap. 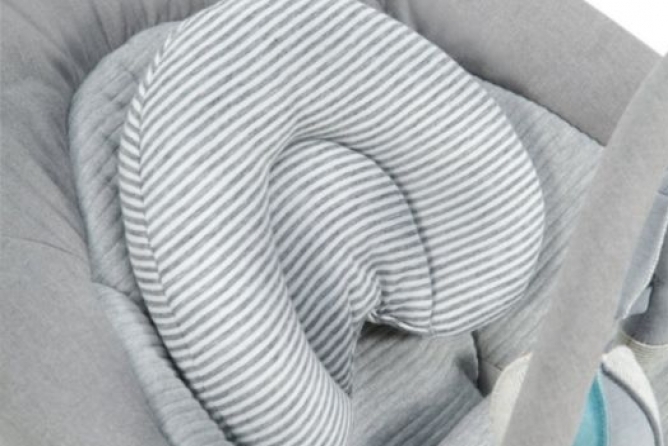 Extra padding and support provide an enclosed feeling for baby, helping them to feel like they’re wrapped in your arms. One disadvantage with this bouncer is its inability to adjust heights. Some babies might not mind this, but most babies are very curious and enjoy watching the action taking place around them. The Mamas and Papas Apollo Bouncer stays in one position (a pretty significant reclined position) so it could also be less comfortable for babies with acid reflux and upset tummies. Some fun comfort features included are the two vibration settings and the crinkle pads for when baby really gets to kicking. The two vibration settings include one setting for soothing. The other setting provides a gentle bouncing motion but doesn’t limit baby’s ability to bounce the bouncer by themselves. A really nice aspect that helps with easy use is the unique and intuitive interface. The Mamas and Papas Apollo Bouncer doesn’t fall under the high-tech category, but this can make it a little easier to navigate. Ever setting has to be manually changed, ensuring that there aren’t technical difficulties or confusion in the long run. The Mamas and Papas website also has a great user guide that helps with understanding this product in depth. The Mamas and Papas Apollo Bouncer isn’t as small as some of the other bouncers on the market. Yet, it doesn’t take up a huge amount of room either. A wide floor base takes up the most room but does provide safe and reliable stability. A huge downside to this bouncer is that it doesn’t fold up for easy storage, making it a big space hog in that aspect. Luckily, despite the larger size, the weight comes in around only 5.5 pounds, so when you have to move the bouncer you won’t be slipping a disk. 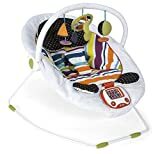 A couple of fun features that come with the Mamas and Papas Apollo Bouncer are the removable toy arch, songs, and vibration settings. The removable toy arch includes three interactive and bright hanging toys. Yet, some parents have claimed that the toy arch is a little too high for younger babies to reach which can cause frustration. 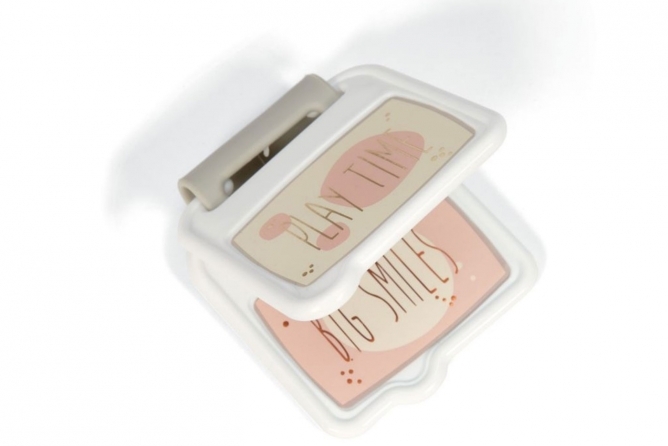 A couple of fun features…are the removable toy arch, songs, and vibration settings. The music book plays four different songs and inserts directly into a slot in the bouncer. You have to manually change each song and it’s been said that babies have a tendency to kick out the music book, causing the music to stop. There are also only two vibration settings included, one that provides a gentle bouncing motion, and one that is gentler for pure soothing purposes. Music book inserts and plays different songs. A really nice aspect of the Mamas and Papas Apollo Bouncer is that the softly padded seat cover can be removed for machine washing for up to 104 degrees F. This equates to a nice warm cycle. It’s probably best to hang dry, or if you have to pop it in the dryer, to dry it on the coolest setting possible. Electric features for the Mamas and Papas Apollo Bouncer are run by 3 C batteries and are not included in the package (why do companies do this to parents?!) The Mamas and Papas website states that buying high power alkaline batteries like Energizer or Duracell. Like most bouncers, the Mamas and Papas Apollo Bouncer only lasts for up to six months of age for your baby. Once your baby reaches 33 pounds or is able to sit up on their own, this bouncer needs to be retired until next time. Once your baby reaches 33 pounds or is able to sit up on their own, this bouncer needs to be retired until next time. As far as performance goes, there have been no complaints of the electric features of this bouncer failing. Due to the fact that there are less high-tech features, this usually provides a more durable product as it is less likely to malfunction or break. The Mamas and Papas Apollo Bouncer is a high-quality product with solid safety, comfort, and interactive features for both parents and baby. One thing that you could cost extra money is the need to constantly replace batteries if you use the electric settings frequently. Oftentimes, it’s pretty common to find a baby bouncer with the same amount of features with a smaller price tag. However, the Mamas and Papas Apollo Bouncer does deliver in the comfort and safety categories, which helps justify the price. The Mamas and Papas Apollo Bouncer is a high-quality product with solid safety, comfort, and interactive features. Additionally, the Mamas and Papas Apollo Bouncer does include a couple accessories that you would normally have to buy separately with other bouncers. This saves money by not having to purchase a toy bar or additional infant support for your baby to actually enjoy the bouncer. All-in-all, the Mamas and Papas Apollo Bouncer is a solid and reliable baby bouncer. It doesn’t boast many of the high-end features of more expensive bouncers. But, the reasonable price justifies the fewer features. Finally, great aspects of this bouncer are the sturdy and safe build as well as the awesome padded seat that ensures baby’s comfort. In addition, there are a few accessories that are included that you often have to buy separately with other bouncers, like the toy bar and additional infant support. 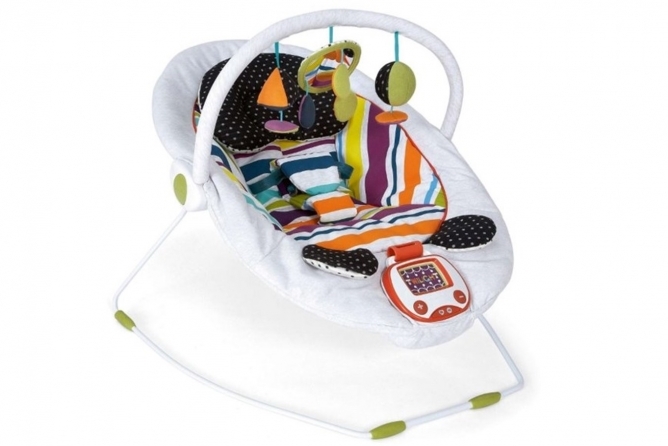 Big features that are missing are adjustable heights for baby’s comfort as well as the larger size of the bouncer. It’s not able to fold down for tight storage, so keep this in mind if you have a smaller house or vehicle. 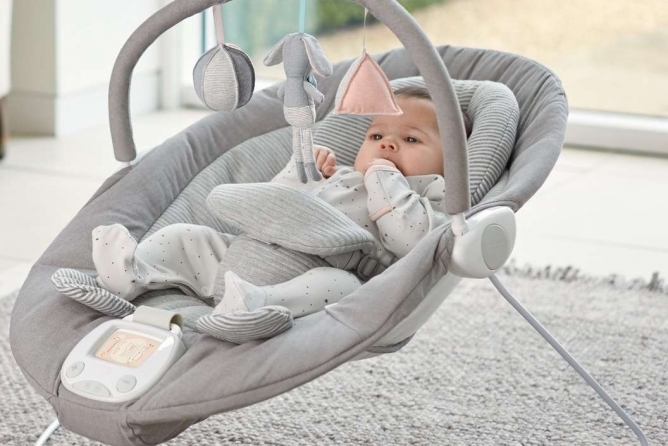 Even with the lack of bigger features, you are making a solid purchase with the Mamas and Papas Apollo Bouncer and it does a great job of keeping baby entertained and safe while you enjoy a few moments to yourself.